Erin, with TecsinRadio.com, sent me this graphic with English translations for the Degen DE1129’s front panel (which is silk-screened in Chinese). This could come in handy for future DE1129 owners less familiar with Chinese. I’ve also added this image in our Shortwave Radio Index. This entry was posted in New Products, Shortwave Radio and tagged DE1129, Degen, Degen DE1129 on August 17, 2012 by Thomas. 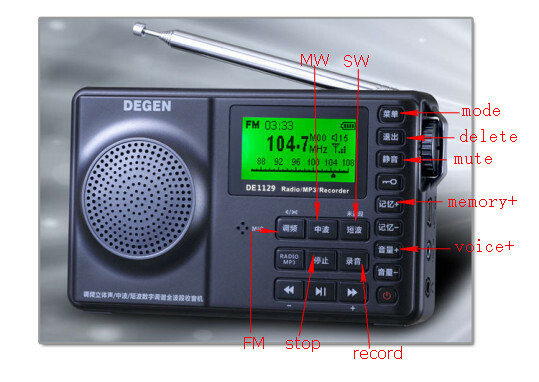 I also put other Language to my site:www.tecsunradio.com ,If you have any problem.Feel free to ask me.I focus on Tecsun ,Degen ,Kchibo,Redsun,Anjian Radio.Please contact if you need these radios. I’ve came across your your Russian translation page for DE1129 panel. if this has something to do with record level, then probably you can leave it as it is. I hope you can read this correctly in your browser. Well, turned out that comments would not accept foreign characters. and there is no way to insert pictures too. Nevertheless, if you’d like to have correct translation, let me know where I could upload or e-mail it. Send the info to me at thomas a t swling.com. I’d be happy to post.